What is neurofeedback? Who may benefit? How does it work? In this blog I’ll answer these and other questions about neurofeedback and share my personal experiences. Neurofeedback (NFB) is a form of biofeedback. 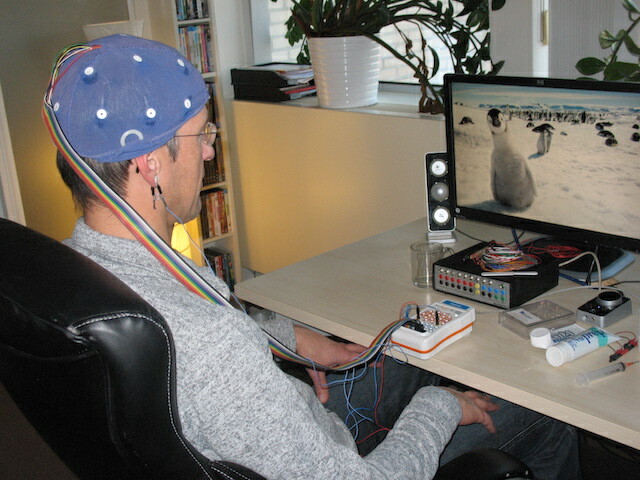 Biofeedback is a method that uses visual or auditory feedback from the body to gain control over involuntary functions. In the case of neurofeedback this is based on the electroencephalogram (EEG) – a test to monitor the electrical activity of the brain. Neurofeedback is therefore also known as ‘EEG-biofeedback’. It is is a non-invasive technique that was invented in the 1950s. It trains the brain to function more efficiently, by optimising/harmonising brain waves. The learning process is subconscious and doesn’t require effort. There are many diagnoses that frequently respond well to neurofeedback training: autism, ADHD, ADD, depression, insomnia, pain, addiction, epilepsy, traumatic brain injury and PTSD. Neurofeedback can also be used for cognitive enhancement or ‘peak performance’. Many people report an increase in their IQ after NFB training. Usually a NFB training starts with a QEEG (quantitative EEG) measurement, which can be interpreted to evaluate brain function. The results are compared to a normative database ordered by age, gender and handedness. This way the possibilities for improvement become clear and form the basis of the treatment protocol. In a typical NFB training session the subject receives a reward when the desired mental state is achieved. There are various types of rewards, but usually it is getting points in a video game or being able to watch a movie fullscreen. Without effort the brain learns better ‘habits’. The electrodes on the scalp pick up the electrical activity of the brain. They just measure; no manipulation – like in transcranial direct current stimulation (tDCS) – is taking place. In general, treatment with NFB lets the brain reach more relaxed states. It also allows the activation of executive functions of the brain that depend on the prefrontal cortex, like attention, concentration and decision-making. Apart from the aforementioned EEG neurofeedback - which is based on electrical activity - it is possible to base it on the blood flow in the brain. These so called 'cerebral hemodynamics' can be measured in two ways. HEG - hemoencephalography - neurofeedback uses near infrared light, either reflected (NIR/nHEG) or passively(PIR/pHEG). In fMRI neurofeedback a functional magnetic resonance imaging (MRI) scanner is used to monitor cerebral blood flow. Finally there is yet another way called Magnetoencephalography (MEG) neurofeedback, that uses the magnetic activity of the brain. The specific applications and (dis)advantages of each method fall outside the scope of this article. The scientific research on neurofeedback is not conclusive – yet. There is a wide variety in study quality and outcomes. It appears that the most studied condition for using neurofeedback is ADHD. There are reviews that find positive results but conclude that ‘further and more convincing research is required.’ Some researchers (Thibault & Raz) state the effects are placebo, but this was refuted by others (Edmund Pigott, Cannon & Trullinger) in 2018. In NFB research there are many parameters. There are different forms of neurofeedback using different training protocols and different equipment while treating different conditions. This state of affairs makes it hard to compare studies and draw general conclusions. However, looking at the overview of neurofeedback clinical trials one can see that researchers the world over continue to set up studies and explore new applications of NFB for pain management, neurodegenerative conditions like Alzheimers and Parkinson’s, and even the prevention and management of schizophrenia. Classifying nfb as an alternative therapy or pseudoscience should be history. There seem to be no known contraindications. There are definitely several side effects, like tiredness after a training session, but these are transient in nature. It’s important that you inform your neurofeedback therapist of these effects. Risks are usually very low when training with a qualified and experienced therapist, who uses established protocols based on an QEEG measurement. I chose to work with a professional NFB provider (Neo-NeuroTherapy, based in Utrecht the Netherlands) over a DIY approach. My purpose was to improve sleep and cognitive function. The first training period was from September till December 2015. The second period from December 2016 till April 2017. In total I did 30 sessions. Both training periods started with a QEEG. During most sessions I watched movies – fullscreen as reward. I kept a detailed journal of both training periods. During some sessions I felt a deep and warm glow in my body – completely different from what I ever felt before. In the hours after the sessions I experienced: tiredness, feeling energised, irritation, light euphoria, changes in bodily function (trembling eye, loss of power in one arm and deep relaxation; all on the left side), higher heart rate variability (HRV), changed colour perception, changes in tinnitus volume, changes in auditory perception, sighing (diaphragmatic relaxation), very good and very bad sleep. All these temporary phenomena were either completely new or outside their usual fluctuation. Long term and lasting effects: more energy (independent of sleep), falling asleep faster, increased intelligence (not measured, but noticeable), more enjoyment and better performance in my work as a teacher and many small improvements in cognitive function. A practical example: it has become easier to to pack my suitcase whenever I travel. However, sleep quality was not improved to my satisfaction. The fact I have been practicing tai chi and meditation for 25+ years, means I am an experienced/skilled observer of my mind and body. This was very helpful in noticing the effects of the training sessions. Observation is the cornerstone of science! Dashboard for the Mindtuner software operated by the therapist. Neurofeedback comes with a price tag ($60 to $120 per session) and it is also time-consuming. The results are not immediate and often you need 20+ (45 minute) sessions. This means a succesful treatment requires commitment and patience. Luckily there is innovation in the field and this may lead to lower prices and shorter treatment time in the future. 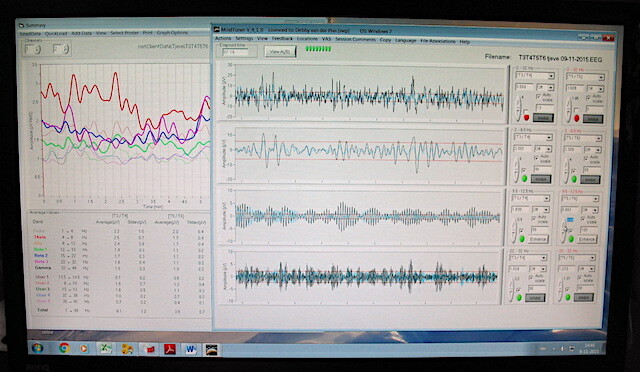 Loreta z-score neurofeedback is such a new method that might give faster results. There is a cheaper alternative in the form of wearable neurofeedback devices like Muse or Melon. They give EEG feedback, albeit from only a few points on the head. This can be useful for learning how to meditate, but is otherwise limited. Versus or Emotiv Insight use more points on the head to collect EEG data and seem superior. Except for Muse, I don’t have personal experience with these devices. Most of them share a ‘one size fits all’ protocol – the training is not based on a qEEG evaluation of the individual brain. Yet another possibility is DIY neurofeedback – building or putting together your own gear. For that NeuroBB or OpenBCI may be good places to start. Neurofeedback induces balance and stability in brains, and so leads to better management of emotional activation and reduction of impulsiveness. Prisons are filled with people who have a decreased impulse control. Several small NFB studies were done in correctional facilities in the US and Spain with promising results. Neurofeedback may well be an intervention to reduce recidivism rate, violence and drug abuse, and so increase global happiness/wellbeing. 1. Are there any supplements, diets, drugs or devices that can increase the effectiveness of NFB training? 2. How effective is the use of PEMF (with devices like the Neurofield) in conjunction with neurofeedback? 3. Is there a role for (transcranial) photobiomodulation (near infrared) to enhance neurofeedback? Despite the fact that there is not a lot of robust science into neurofeedback yet, my conclusion is that it is an intervention that works and can produce lasting results. This is based on my own experiences and the experiences of others whose judgement I value. Also the mechanism of action is similar to that of other effective forms of biofeedback. New technologies, protocols and applications for neurofeedback are being developed and studied in clinical trials. I recommend neurofeedback as a general intervention. 1. Before I decided to invest time and money in neurofeedback I watched several interviews with neuroscientist Andrew Hill on youtube. 7. Overview of studies per diagnosis on the Peak Brain website.